We're bringing you a bloody good roundup of menses in the movies. From tampon trouble to genuine terror, these young ladies just weren’t ready for their first flow. 2. The Runaways (2010) — Cherie’s first menses bursts forth when she least expects it, so an emergency trip to a public restroom is necessary to staunch the flow. 3. Carrie (1976) — Naïve, abused Carrie has a freak-out in the school showers when she thinks she’s bleeding to death following her first—very public—period. The link between the monthly cycle of werewolves and the monthly mood swings that women endure pre-period is cinema gold. 4. Dog Soldiers (2002) — “It’s that time of the month,” asserts a sassy redhead before changing into a menstruating werewolf and attacking a terrified squad of military men. 5. Ginger Snaps (2000) — Ginger is bitten by a werewolf following her first period, and her sister Brigitte struggles to differentiate between the symptoms of impeding wolf-dom and the regular surprises that come with puberty. Brazen gals brandish their periods like weapons when confronting squeamish dudes. 7. Mean Girls (2004) — When the principal of North Shore High asks his students if any of them has a “lady problem,” he’s treated to graphic explanations of heavy flows. 8. Superbad (2007) — A menstruating woman grinds up against a high schooler at a party, leaving bloody evidence on his pant leg. In these foreign films, even the dead need to stock up on tampons. 9. A Tale of Two Sisters (2003) — In this South Korean fright fest, Su-mi finds blood on her twin sister Su-yeon’s side of the bed, but the cause is more complicated than just a leaky pad. 10. The Menstruating Ghost of Puncak (2010) — An Indonesian horror-comedy about a ghost on the rag, Hantu Puncak Datang Bulan made its debut in Jakarta in 2010 and was quickly condemned by the country’s highest council of Muslim clerics. Luckily for the filmmaker, no fatwa was issued. 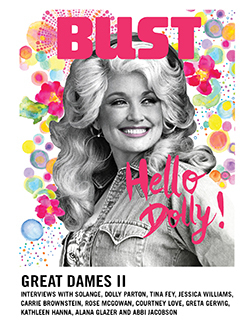 This story appears in the Oct/Nov 2013 issue of BUST Magazine with Neko Case. Subscribe now.